Introducing the exciting new MILLENIA MG3 CLASS BD INTEGRATED AMPLIFIER from TBI Audio Systems where Quality, Audio Performance, Execution and Mobility take front stage. This amplifier represents the state of the art in its construction and execution of linear and class BD electronic technology for a new level of audio enjoyment at home and on the go. While this new amplifier was designed to complement our HDSS® based Majestic Diamond Audio Monitors it will benefit any quality speaker system. The MILLENIA MG3 is green by design seeking out all energy saving measures as an integral part of its operation. All auxiliary functions are precluded from its features. MILLENIA MG3 offers high-end linear and class BD audio technology coupled with green environmental features allowing you unprecedented enjoyment even when you are unplugged and on the go. MILLENIA MG3 enjoys specific circuitry that is targeted for this application. Your source equipment is introduced to MILLENIA using amazing new Burr Brown op amp technology achieving a 250V/us slew rate and low power consumption. This unique operational amplifier buffers the source providing the proper impedance for the GEN 3 class BD amplifier maintaining blurring speed into its comparators linear inputs. Its output stages maintain a linear distortion characteristic with input level changes much as the GEN 3 class BD amplifier. The unusual operation of the op amps input buffer transports your source signal unaltered right into the precision sampling input of the GEN 3 class BD linear stage for precise conversion into Differential Pulse Duty Modulation (DPDM) output. The 75k ohm input impedance was carefully selected to optimize the transfer of the signal into the amplifier. The high slew rate inputs are virtually completely independent of external source output impedance and level for optimal signal conditioning. The slew rate, which is a measure of how fast an amplifier can respond to its input, is normally slow and uncoordinated as the signal is throughput creating a haze around the sound especially in an amplifier of this price range. The signal is now present at the output when it is present at the input with virtually no delay or distortion added. Typically class BD amplifiers are slew rate limited by their associated circuitry. A fast linear conditioning stage coupled with an efficient low distortion class BD output platform is the future of the audio amplifier. MILLENIA MG3 was developed with a focus on sound without parasitic circuits or features to compromise its reliability, drain its batteries or interfere with musicality. MG3 is non-inverting and phase coherent for precise system integration. While the experts will continue to compare the CLASS D amplifier to its class A and AB counterpart the truth is that properly designed class BD eliminates the non-linearity associated with linear power amplifier circuits. The linear amplifier is fine when used to process low level signals but when it comes to interfacing to the speaker, which is a transducer there is no comparison. The action of transferring power to the loudspeaker cannot be handled more precisely than with the GEN 3 CLASS BD amplifier topology. While the linear power amplifier gets close to zero output impedance at low frequencies the MILLENIA has a near textbook output impedance for all signal transfer. The non-linear current in the transistor is completely avoided making bias and heat induced distortion variations a thing of the past. Linear audio power amplifiers have a THD distortion component that varies with output power. This means that the transfer function of the amplifier changes slightly with power output as it attempts to maintain a low distortion. With this simple classic execution of class BD principles an unprecedented DPDM replicates the voltage of the signal through the speaker system with uncanny precision. GEN 3 CLASS BD places the signal from your source component into your speakers voice coil in precise current increments maintaining essentially the same low THD signature at all levels below clipping. Crossover networks operate more precisely when the impedance and distortion are held low and remain constant for all levels and signal complexity. Sound inherently varies dynamically requiring a topology that defines a constant transfer characteristic as power and bandwidth change. 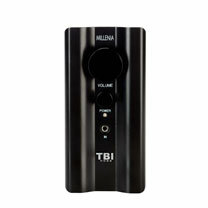 The MILLENIA sounds louder for a given power output at the speaker as a result of the absolute control it exerts at the load making its 30 W seem like a musical 50 W.
The GEN 3 CLASS BD modulation is unique in itself virtually eliminating the need for a filter to reduce distortion producing zero signal switching current into your speakers. The application of a DPDM to reduce zero signal switching levels has allowed basic class BD principles to come alive in this product. There is also patent pending technology to eliminate clipping instability in the unlikely event that you should overdrive the amplifier. This cutting edge technique is responsible for a symmetrically clipped waveform and an extended max power rating for MILLENIA. Into an 8 ohm load the MILLENIA MG3 amplifier provides 8 watts of power per channel at less than 1% distortion and 10 W at 10% with controlled clipping recovery when operating on 8 internal AA batteries. When using the AC power supply, which provides twice the voltage of the battery, this unique product delivers 32 W of power per channel for musical passages at less than 1% distortion while having a maximum power rating of 40 W at 10%. High quality gold binding posts assure that you can use your favorite termination and cable to deliver this quality sound to your speakers. The gold plated inputs of the MILLENIA amplifier can handle input source voltages from less than .1V to 4 volts while the precision volume control maintains freedom from overloads at the GEN 3 class BD linear input. This means that you will have adequate gain to bring low level sources to the desired listening level while taming those hot devices having strong output signal level. 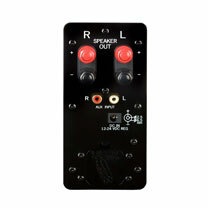 This will allow even low-level source speaker or headphone outputs to drive the amplifiers inputs to achieve improved sound from the component. Typically the speaker/headphone amplifier from your source will deliver its best performance when not loaded heavily. MILLENIA has two inputs to handle your needs, one is a front mounted 3.5mm mini jack designed to accommodate your on the fly multimedia sources while the rear located RCA jacks maintain connection to your main source(s). The front mounted jack overrides the rear jacks when it is used. The MILLENIA MG3 is guarded from abuse from bad power supplies and reverse power connections. While it will operate best from a 24V – 3A regulated power supply such as the one supplied, the MILLENIA MG3 will perform amazingly well with any regulated DC supply between 12 and 24 volts using proper termination. While 3 amps are required for full peak RMS output, lower rated supplies will work as long as you don’t use excessive volume, which is great when you have a power supply emergency and need quality sound. MILLENIA is protected from malicious experimenting or supplies gone wild with a precision electronic crowbar that will blow an internal fuse to protect the circuitry inside from damage. Its LED glows a cool blue intensity when operating on external power and red when operating on internal batteries. The MILLENIA MG3 amplifier is also guarded against thermal overloads and short circuits with instant recovery from the short if it is removed. The unique MILLENIA amplifier is protected at its input, output and from wrong power supply conditions. Reliability is solid and represents added value for the MILLENIA amplifier so it works when you need it most. Efficiency is inherent in every aspect of the MILLENIA MG3 design. While having 90% efficiency when operating on batteries it will exhibit near 100% efficiency when your music stops in sleep mode or at the end so you don’t consume extra battery power when nothings playing. Of course the restart is invisible with your music instantly playing when you resume play. This is an excellent feature because the sultry sounds of this musical amp will nearly always lull you to relaxation and sleep especially at low levels when conventional amplifiers typically get confused. There are no pops or noises associated with the standby mode or operation of the power switch. The batteries load easily into their enclosure through a rear access door. They drop right out and right in for a quick and easy battery change. The MILLENIA operates best on 8 fresh AA e² photo lithium or alkaline batteries producing 12V but will operate reliably even using general purpose or available lower voltage rechargeable cells. The maximum power is limited in the latter case but the 9.6 volts remains until the batteries discharge so there will be a good life even for this type of battery. You can expect several days of low volume intermittent listening so there may be a need for extra batteries for your player to keep up. The MILLENIA MG3 is designed to survive the rigors of an on the go lifestyle with its scratch resistant and attractive all black aluminum housing. It does more than house its precise electronics as the enclosure helps blocks EMI transmission and reception. When coupled with its accurate electronic filtering the beautiful MILLENIA MG3 integrated class BD amplifier easily conforms to worldwide EMI emissions standards. The beautiful encasement will also have your friends staring in amazement at this tiny component as it fills the area with amazing sound. You can easily disconnect it and put it your suitcase or bag with your micro speakers and enjoy spectacular sound elsewhere. Finally there is an available and affordable amplifier solution for the modern lifestyle, small, powerful and ready for those on the go applications and has uses from high-end kitchen or bedroom HDTV to a fully complemented audiophile music system. 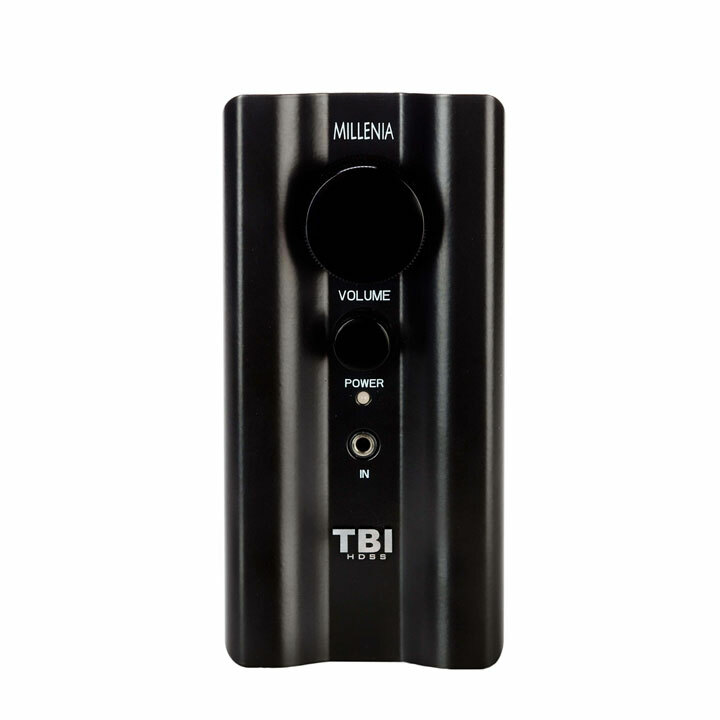 MILLENIA MG3 by TBI Audio Systems is the worlds answer to bad sound in your home or office anywhere and wherever that may be. The MILLENIA MG3 comes with a 2 year limited warranty.